Kentmere 8 x 10" Select Variable Contrast (VC) Resin Coated (RC) Paper is a professional quality resin-coated, medium-weight, variable contrast paper designed for use by the most discriminating photographers. This is an excellent paper for both amateur and professional use. The smooth, even tones as well as the ease with which it prints will please you. Box Dimensions (LxWxH) 10.8 x 8.8 x 1.6"
Select Variable Contrast Resin Coated Paper (8 x 10", Fine Luster, 100 Sheets) is rated 4.8 out of 5 by 4. 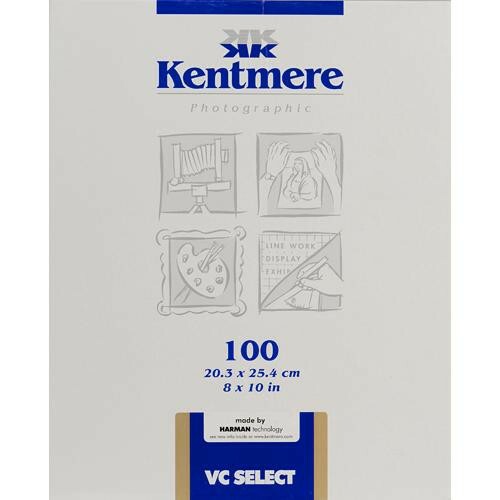 Rated 5 out of 5 by Karen from Great Value Kentmere luster is a staple in my darkroom. While I tend to use Illford's papers for final work, the Kentmere is terrific for test prints, contact prints and the occasional final print. I would rate its normal grade at 2.5, so it's a bit more contrasty than Illford's normal grade. Also it's faster, requiring about 20 percent less exposure time than Illford materials. Rated 4 out of 5 by Wade S. from Reccommended. I use the Kentmere BW darkroom photo paper for my analogue film class and I think the prints come out great and the chemicals sit well on the paper. Rated 5 out of 5 by tsnithe from Good stuff! good stuff!